It's time once again for the cottage cooking club to come together and posts our thoughts and experiences for the month. We are a group of international blogger's bound together by our love of fresh seasonal veggie dishes from Hugh Fearnley-Whittingstall's cookbook, "River Cottage Veg". Our group is meant to be a project aimed at incorporating more vegetable dishes in our everyday cooking, and is and has been inspired by our dedicated leader Andrea of The Kitchen Lioness. Each month Andrea picks one recipe from each of the 10 chapters and then we pick and choose as many as we have time for. Sadly this is our last month of cooking from this wonderful book as we have completed the 220 recipes in “River Cottage Veg”. But never fear in May our little group will start two more of Hugh’s books. One is titled "River Cottage Every Day" and the other one is "Love Your Leftovers". Please join us! Our motto for the month of April is: “Last but not least”. The first recipe I prepared was the roasted potatoes and eggplant. Roasting vegetables in the oven helps them to caramelize just a little and gives them extra flavor. The potatoes were nice and crisp and the eggplant was soft and silky. Garlic was added at the end and roasted 10 more minutes. When removed from the oven the veggies were given a squeeze of lemon. Hugh also recommends freshly grated lemon zest, hot smoked paprika or chopped herbs. I will be preparing this dish often as I loved the combo. Also this was simple and easy to prepare. The second dish I prepared was the Various rarebits. Welsh Rarebits is a dish of savory cheese sauce served over toast. In this version Hugh had us make a simple béchamel sauce with cheddar cheese. Bay leaf and onion are infused with milk to give the sauce even more flavor. 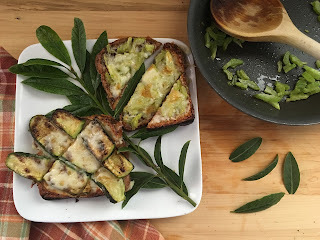 I first toasted the bread then added the sauce, topped one sliced with celery slices that had been sautéed in butter until tender but still crisp. The other slice was prepared with leftover zucchini that I had grilled the night before. I thought the flavor was delicious but both of my toast were a little soggy in the middle. Not sure how everyone else did at this point. The third and last recipe was Linguine with mint and almond pesto. Here the pesto is made out of toasted almonds, mint, garlic and lemon zest. Notice there is no cheese, the cheese is added as a garnish at the end. The pesto is then given a good squeeze of lemon and a little salt and pepper. This was easy to put together. 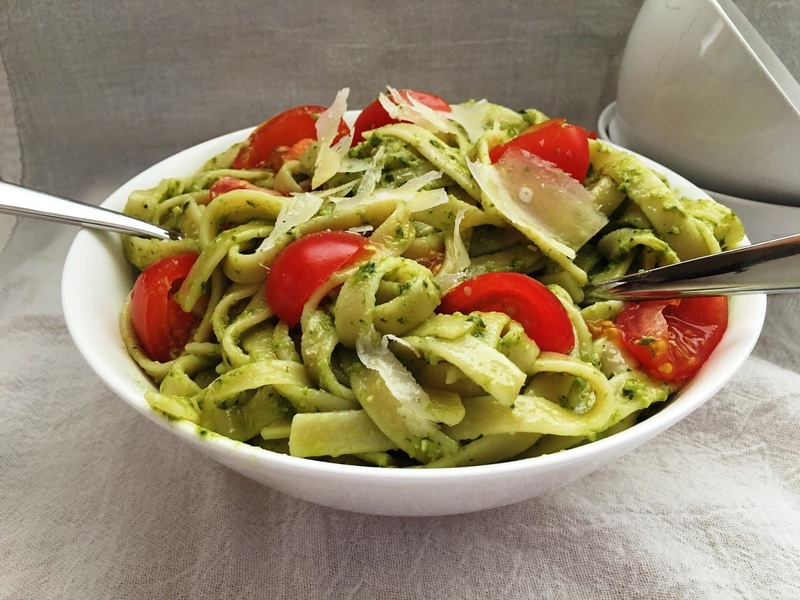 The cooked pasta is tossed with pesto and half of the tomatoes. The other half is added to the individual serving bowls with the Parmesan cheese shaving when ready to serve. This was light and refreshing. Hugh also recommends using this pesto for salad dressing, just thin with a little olive oil. These recipes have been slightly adapted from the "River Cottage Veg", by Hugh Fearnley-Whittingstall. First recipe; from the chapter "Roast, grill and broil” Roasted potatoes and eggplant (page 351). Second dish from the chapter "Bready things" Various rarebits (page 209). Third recipe; from the chapter “Pasta and rice” Linguine with mint and almond pesto and tomatoes (page 266). To see what recipes the other members chose for this month, head over to the LYL post for April 2016 on the CCC website, by clicking here. It is not possible to resist Welsh Rarebits. Hi Amalia, never heard of them before until this recipe. Thanks for stopping by. Great with the potatoes and eggplant, sounds delicious! And so do the other 2 dishes, mouthwatering goodness! Thanks Pam, it was another great month. Thanks Linda, appreciate the comment. Hi Anne, so glad that you are going forward, I am still waiting for one of the books to come, it was back ordererd. Can't wait to start anew. Hi Cheri, the potatoes and eggplant were indeed so wonderful I do believe they may be considered one of the top favorites from the cookbook! It has been a nice journey with lots of new and varied ways preparing lots of vegetables. See you again soon! Hi Peggy, oh I agree, the potatoes and eggplant were fabulous together. It has been alot of fun cooking together, can't wait to start the new books. Thanks Tandy, never thought to use it as a salad dressing before. Potatoes and eggplants are fabulous, Cheri. And that pesto is irresistibly yum! Thanks Anu, we loved both dishes. Hi Cheri, As usual all of your dishes look delectable! I love how much flavor is added to each dish in various forms. I think I would love the potato and eggplant dish. Roasted veggies are almost like candy to me! The pesto is such an interesting one. I have never heard of using mint for that. The rarebit was new to me. I had heard that word, but had no idea what it was. Thanks for sharing your pictures and yummy recipes! Hi Shari, the rarebit was new to me as well, mine were kind of soggy, but everything else was delicious. Take care! It's so hard to believe you've finished book one already! I will look forward to the future, and more fun posts. These three recipes are all very different, and I'm going to try the potatoes and egg plant on your recommendation. When I saw the recipe in the book, I was a little skeptical. Thanks! Hi David, potatoes and eggplant are magical together, hope you get a chance to try it. Everything looks delicious Cheri! I'm especially loving your rarebit variations - I've become a big fan of toasties since Hugh introduced them to me. Hi Zosia, I have enjoyed the toasties as well, was not a big fan of the rarebit version, mine were a little soggy. Take care! They look very delicious, Cheri. Welsh Rarebits is new to me..but I know I would love it because of cheese and toast. Thanks Angie, Hugh had a few recipes involving toast and I really enjoyed all of them except this one was a little soggy. Cheri, wonderful dishes and how great you belong to the Cooking club. A great way to share recipes.....P.S. I still have that template if you ever are thinking of a change. Hi Linda, yes it's been 2 years and next month we start a new book. Nice template. Dear Cheri, you did an outstanding job with all of your dishes this month. I am grateful that you so enjoyed our journey through Hugh´s Veggie cookbbok - it has been a pleasure to cook along with you all the way! Thank you for all your kind and considerate comments, support and for sharing your love of great food with all of us! Hi Andrea, I wanted to thank you for all that you have done for the Cottage Cooking Club group, you kept us all together and organized no small feat. I had so much fun and learned a lot of new things, it has been an adventure. What a lovely collection of recipes! Welsh rarebit was my mothers go to recipe if she didn't feel like cooking. I will be trying the potato dish! Hi Julie, never heard of Welsh rarebit before this cookbook, love learning new things. wow, you're a busy cook these days, Cheri. I am loving all of these recipes and your pics are looking fabulous! I've never had Welsh rarebit but you have inspired me to give it a try. Beautiful! Thanks Robyn, Welsh rarebit was new to me too, there seems to be always something new to learn. Your photos are making me so hungry! Thanks Cathleen, have a great week. Thanks Kim, "toast" is one of the best things that I have learned from this book. Hope you are having a great week-end. Your three dishes look good. I too made three dishes in April with the third being Linguine with almond and mint pesto! Hi Emily, the linguine was delicious wasn't it. Another great month. These may be last, but certainly not least. What an accomplishment. Can't wait to see what is next! Me neither Abbe, the best has yet to come. Hi Teresa, another adventure for sure, had such a great time cooking with you along the way. Will keep in touch.